New Mexico is strong when our families and communities are strong. The strength of the state’s economy rests not just on the businesses that employ our workforce, but also on the purchasing power of our families. With some of the highest rates of poverty and income inequality in the nation, New Mexico’s economic future faces significant obstacles. Every state’s greatest resource is their human capital. States that make appropriate, targeted and sufficient investments in their people have the highest quality of life. But when a high percentage of their people face persistent, systemic and policy-related obstacles—such as generational poverty, structural racism, historical trauma, and decade-upon-decade of marginalization— states must take a more focused, comprehensive approach to those investments. They must ensure that the systems they put in place to help people overcome these obstacles are evidence-based, tailored to specific needs, accessible, coordinated, and effective. While New Mexico’s high poverty rate is nothing new, the state hit rock-bottom in terms of child well-being in 2013. 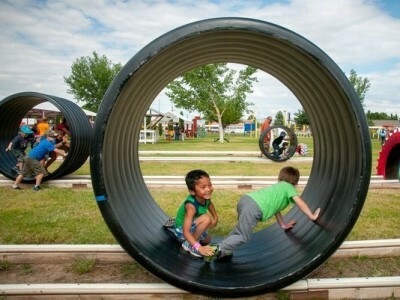 That was the year the Annie E. Casey Foundation’s (AECF) widely respected KIDS COUNT program ranked New Mexico dead last among the fifty states in children’s well-being. While that pronouncement generated a great deal of public dialog and concern, state leaders have yet to consider—let alone adopt—a comprehensive plan of action to address the issue. 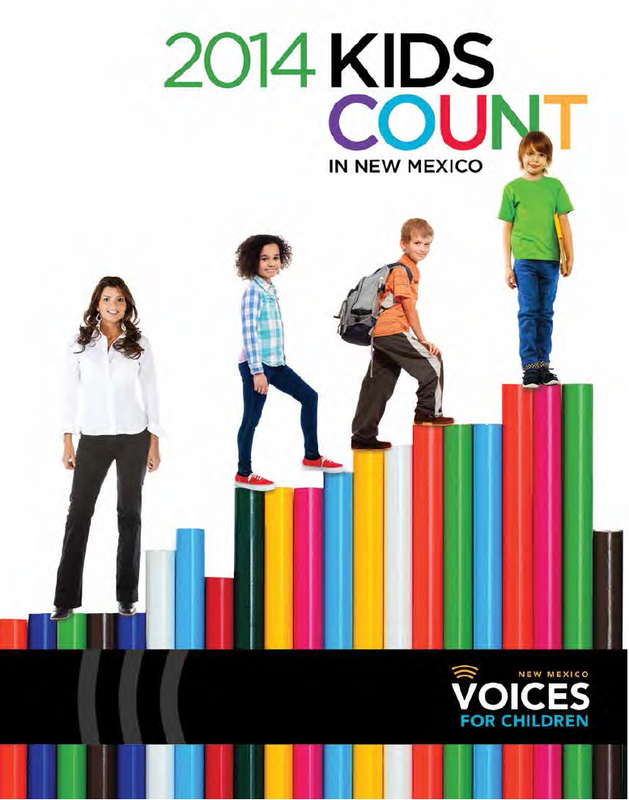 In response to the 2013 ranking, and the poor prognosis it foretells for the state, New Mexico Voices for Children added a Trends and Rankings section to our annual KIDS COUNT in New Mexico data book. This section tracks how and whether the state and its counties are making progress in addressing the sixteen key indicators used by the AECF to determine child well-being. As state policies significantly affect whether children have access to the opportunities they need to succeed, the Trends and Rankings section also includes policy recommendations. The recommendations included here represent a small portion of the policy solutions that are available in our NM KIDS are COUNTing on Us policy agenda (which is available online here). No matter which policies New Mexico’s leaders adopt to improve child well-being, it is critical that they take a two-generation approach. As children do not grow up in a vacuum, their welfare depends on the strength and resources of their families and communities, as well as the business, health and education systems and government policies that affect them. Any programs that seek to improve child well-being must consider the needs of the parents and must be coordinated with services that address those needs. Two major factors in New Mexico underlie why policy-level and programmatic efforts to improve child well-being are needed now—poverty and race/ ethnicity. The state’s high poverty rate—one in five New Mexicans live in poverty—is one of New Mexico’s most challenging problems. When parents struggle economically, youngsters face stressors that negatively affect their brain development, long-term health, socio-emotional behaviors and well-being. While being employed should lift people out of poverty, more than half of our working families are poor—that’s a family of three living on an annual income no higher than $19,790. Too many jobs not only fail to pay a family-supporting wage, they also do not offer basic benefits such as paid sick leave. Another quarter of our working families are low-income—that’s a family of three living on no more than $39,580. One reason so many of New Mexico’s working families can only find low-wage jobs is that our labor force has lower levels of education than those in other states. Of workers ages 18 to 64 in New Mexico, 15 percent have not graduated from high school and 69 percent do not have a college degree. Unfortunately, New Mexico does not provide enough of the resources, time or support systems working parents need in order to improve their education either by attending college or receiving job training. Investments in educating parents provide more than economic benefits for our families and the state. The higher a parent’s educational level, the more likely their children will do well in school and graduate. Higher parental education is linked to better-developed communication skills in their children. Language skills, along with social, emotional and physical health, are critical if children are to do well in school. Single-parent families tend to have lower incomes and fewer resources than do two-parent families. Unfortunately, in New Mexico and the nation there is an increasing trend toward more single-parent families, especially those headed by single-mothers. Infrastructure such as affordable child care provided by caring, qualified adults is especially critical for these parents. For New Mexico to prosper, we need the talents and abilities of every child in the next generation available to our communities. Yet, racial and ethnic disparities— clearly different outcomes for children of different racial and ethnic groups—suggest that we run the risk of losing out on the potential of some children. While the population of the United States as a whole will not be minority-majority for several decades, New Mexico already has a minority-majority populace. Our state is also one of only four in the nation with a minority-majority child population—meaning the majority of children (75 percent in New Mexico) are of racial or ethnic minority groups. 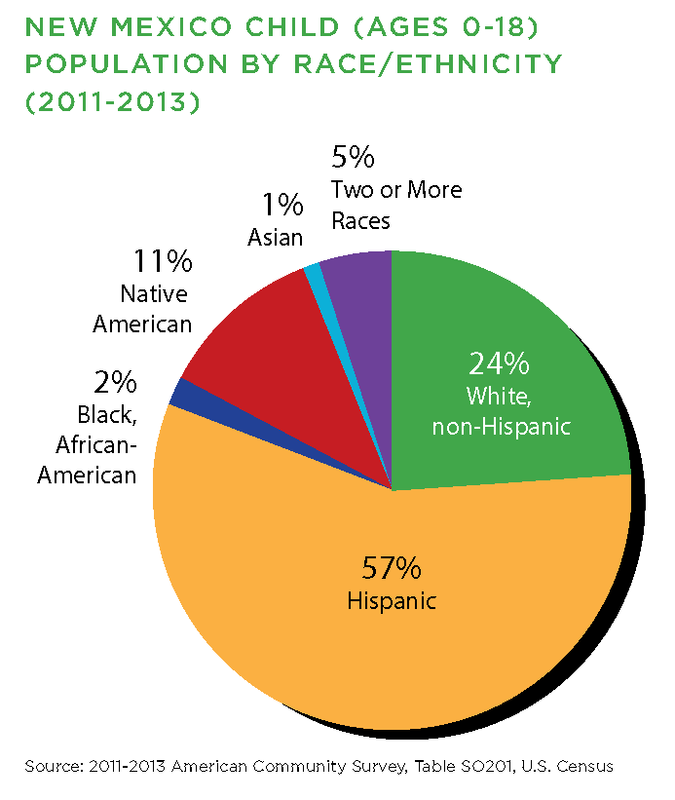 By far the largest ethnic group in New Mexico is Hispanic. 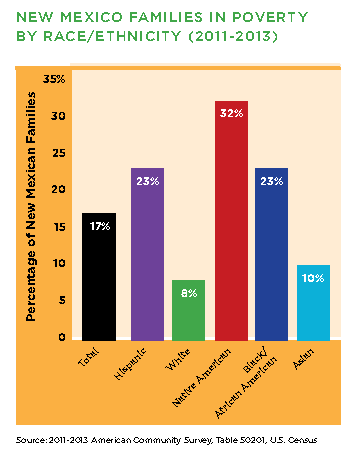 And while the majority of New Mexico Hispanics identify racially as White, Hispanic children as a whole do not fare as well as their non-Hispanic White peers. With such a significant minority-majority child population, the economic and social price of letting our minority children remain behind is already much too high. In 2014, the Annie E. Casey Foundation released the KIDS COUNT policy report Race for Results: Building a Path to Opportunity for all Children. It measures the states on a set of twelve equity indicators representing factors that influence a child’s ability to succeed. Each state is given a composite score for each racial/ethnic group in the Race for Results Index. 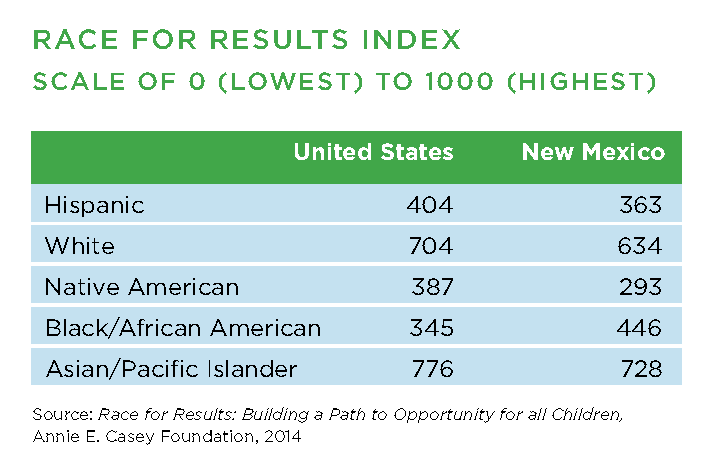 The scores, on a scale of 0 to 1,000 (with 1,000 being the highest), indicate whether or not a child is likely to be progressing on key developmental milestones across states and racial groups. 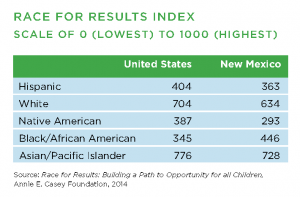 These data again demonstrated that New Mexico is performing poorly in supporting its racial/ethnic minority children. Only our Black children, who are concentrated in Clovis and Alamogordo (both of which have military bases), score higher than the national average for their racial/ethnic group. When looking at data that are disaggregated by race and ethnicity we see disparities in virtually every indicator of child well-being. Racial/ethnic minority children and families are more likely to live in poverty than their White counterparts, and are less likely to live in two-parent families. While 64 percent of all children in the state live in two-parent families, only 47 percent of Native American, 55 percent of African American, and 63 percent of Hispanic children live with two parents. Prenatal care throughout the entire pregnancy helps mothers have healthy babies who are born at normal birth weights. Yet, children and mothers of color are not well served by the state’s health care system, as our Native American, African American and Hispanic mothers are more likely than White mothers to receive only late or no prenatal care. This sets these children up for potential developmental delays or health problems. While the achievement gap in education may be slowly narrowing in some areas, our minority children still lag behind their White peers in terms of reading and math proficiency scores, graduation rates, and college attendance. Educational equity gaps begin early. Though high-quality early childhood care and learning services prepare preschoolers for K-12 success, too many of New Mexico’s minority children are unable to participate in these services. More than 50 percent of Hispanic and 46 percent of Native American toddlers are not enrolled in preschool or kindergarten, which can put them at a learning disadvantage when they start school. Such early learning disadvantages contribute to the overall lower percentages of New Mexico’s minority students who are proficient in 4th grade reading and 8th grade math. Proficient reading ability at 4th grade is a key indicator of whether students will succeed in the rest of their educational career, and students proficient in math are more likely to complete college and do well in the workplace. Many public policies and programs meant to help close inequities for children and families tend to focus on either parents or children, but not on meeting the needs of both. In fact, programs may inadvertently put parents’ and children’s needs at odds with each other. For example, a parent attending job training programs or college may not be eligible for child care assistance. This may mean their children end up in unsafe or substandard care. State, federal and foundation-funded programs intended to help these families and/or children are generally not structured for interagency collaboration, and tend to operate in isolation from each other. For parents with limited resources, learning about, accessing and seeking assistance from this maze of programs can be a monumental task. In another 2014 KIDS COUNT policy report, Creating Opportunity for Families: A Two-Generation Approach, the Casey Foundation makes three overarching recommendations for ensuring a two-generation approach. Create policies that equip parents and children with the income, tools and skills they need to succeed—as a family and individually. Adopting policies at the state and employer level, such as paid family, maternity and sick leave as well as family-friendly scheduling, to help working parents take care of children in times of need. Put common sense into common practice by structuring social services to respond to the realities facing today’s families. Enacting an express-lane approach using eligibility data for one program, like SNAP, Head Start or Medicaid, to enroll children in other needed programs. Using financing options, such as SNAP Employment and Training funding, to provide job-training, along with early child care, after-school care, and transportation for parents. In the data pages, you’ll find more information on how both our children and families are doing. In tracking outcomes for the sixteen KIDS COUNT indicators, we note some encouraging signs from 2013—fewer households dealing with a high housing cost burden, more children covered by health insurance, lower child and teen death rates, lower teen birth rates, and more household heads who have a high school diploma. At the same time, certain outcomes continue to be discouraging—more children in poverty, as well as living in high-poverty areas, fewer teens in school and/or working, little progress in reading and math proficiency or in high school graduation, and increasing numbers of children living in single-parent families. All children, regardless of social and economic status, race or ethnicity, should have the best possible shot at reaching their potential. All children need the early learning opportunities that will put them on the path to success in school, as well as safe communities with resources, services and amenities, an effective health promotion and care system, and a solid economic base that provides adequate family-supporting jobs. Providing these opportunities, through two-generation policy changes, to all children and families in the state is essential to the state’s—and nation’s—prosperity.